Aching piano instrumental from the North of England artist ahead of a new album in the summer. Matthew Bourne has spent the last few years exploring the edges of improv with Moog workouts, audio visual collaborations and Kraftwerk interpretations (sometimes all at the same time). While those were fascinating, there’s something very satisfying about this return to piano, to territory reminiscient of his wonderful Montauk Variations album from 2012. Plaintive and spare piano notes gather long contemplative cello drones leading to a surprisingly suspenseful atmosphere. It’s a thing of beauty and I can’t wait to hear more from the album. A selection of dreamy kosmische cuts this week. Jane Weaver making something vulnerable and really beautiful out of interweaving synths. Percolator with lovely gauzy shoegaze textures. The Saxophones have a veil thin dream pop. And Matthew Bourne is back with sublime instrumental piano music. A gorgeous wolf in sheep’s clothing. An unsettling wrongfooting piece of songwriting. Wearing a sublime French jazz costume. What a brilliantly double edged ocean of possibility. Delicious mixture of the propulsion of Stereolab and the textures and crunch of My Bloody Valentine from this Dublin band’s debut album. There are many things to love about the album – the sense of adventure, the absorption in ideas for their own sake (an improv spirit maybe), the embrace at the same time of pop melodies, the sheer breadth of sounds generated throughout the album – but I think my favourite is that great quality in any band or album, not trying too hard. I can think of ten other bands who might have taken a rough draft of these songs and turned them into bombast, beating you over the head with the ideas and in the process murdering any beauty. Percolator have that wonderful thing, restraint, so instead they stick with the ideas, the raw elements and see them through, not just as means to an end but as diamonds in themselves. Glorious kosmische pop music with a motorik pulse from the Manchester artist. There’s a beautiful weave to the synth lines, a carefree quality, a cavort suggesting the tumble of the universe somehow. But it’s Weaver’s voice that crowns the sound. Close and persuasive – let’s go outside when it doesn’t feel right / we can disappear – it uses simple elegant phrasing with an endearing down to earth tone which has a hint of world weary about it. The effect of this simplicity againt the thick swoops of cosmic backing is to make a strange atmosphere. Like the best science fiction, it says otherworldly but still recognisable. The arrangement is a dream of serene space, inner and outer. On the most significant weekend in the Christian calendar, there was something appropriate about the primal and even pagan undertones of this wonderful show of live music and (I’m going to say) ideas. 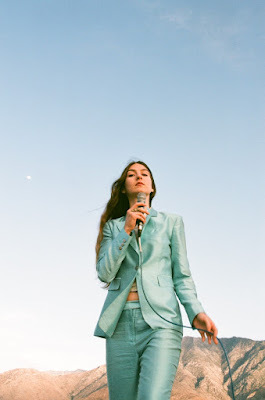 Firstly we must speak about the sheer presence of Natalie Mering on stage (which is only added to by the remarkable sky blue with white clouds trouser suit, a sort of David Byrne meets Pop Art statement). You could call it a certain kind of cool. It certainly comes across as a confidence but with no sense of distance or aloofness to it. There’s a distinct warmth to her stage persona, or we might just say her personality because there’s no hint of artifice, just an easy engaging quality. A bunch of folk music in the first half of the show this week. Richard Osborn, wonderful pastoral American primitive. Seti The First, magnificent string based instrumentals. And in the second half, much of the louder variety. Percolator, mashing MBV & Stereolab together beautifully. Can, looping the loop wonderfully. And from Brussels, Manu Louis (pic) with an amazing soundclash of 8 bit, electro, orchestral and whatever you're having yourself. 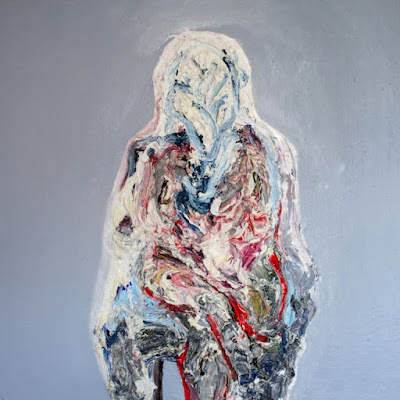 ...ranging from the meditational to the flippant, the playful to the otherworldly, gospel to kosmische. A lash of new music with various psychedelic shades this week. The beautiful pulsing kosmische of Jane Weaver. The lush dream pop of Laetitia Sadier Source Ensemble. The wonderful Go Team-ish 60s girl gang sound of Whyte Horses. The swooning psych folk of Entrance. Some instrumental cuts too, including two great soundtrack pieces. & Brian Gibson of Lightning Bolt s'tracking the video game Thumper. Plus Matthew Bourne back at the piano to majestic effect. A number of soundtrack cuts on the show this week plus a couple of great a capella tracks. Jean Claude Vannier is best known for arranging some of Serge Gainsbourg's greatest songs. He was also a composer in his own right and experimenter in all kinds of genres. Here we have a female choir singing, vocalising, exhaling, finger clicking, foot stomping...it's fantastic stuff. Rebekah Del Rio giving a great song one of the most magnificent cover makeovers ever, as used brilliantly in the David Lynch film Mulholland Drive. Mica Levi from the film Jackie, a glorious piece of musical counterpoint - the light as a feather flute with the deep sea draw of the cellos. Jerome Moross with an iconic western soundtrack from The Big Country. And Seti The First, not a soundtrack per se but it feels like it could be music for a film - thrilling, poised, orchestral instrumentals.